The Faculty of Economics and Social Sciences is the biggest faculty of the Szent István University with its approximately 4000 students. The Bologna system was implemented in 2005, and now the Faculty has 9 basic majors in BA/BSc (management, finance, marketing, tourism, agriculture, HRM) and 9 MSc courses in different economic (marketing, finance, logistics, regional development) and human disciplines (leadership and management, HRM). Our Faculty offers vocational trainings in higher education and provides a MBA programme in Hungarian and English languages (which runs under the name WeSt MBA program under the cooperation of Webster University and SZIU). There are two Doctoral Schools at our university (Doctoral School of Management and Business Administration and Enyedi György Doctoral School of Regional Sciences). The Faculty has educational centers at different Hungarian cities, for example in Budapest, Jászberény, Békéscsaba, Szarvas and in the city of Csíkszereda (Miercurea Ciuc, Romania) as well. Nearly 300 students take part in the English speaking courses which shows the strong international relations of the Faculty. Czestochowa University of Technology is the largest university in the region. In the 2013/2014 academic year it celebrated the 65th anniversary of its activity. Faculty of Management is the largest organization unit of Czestochowa University of Technology 6000 students are acquiring knowledge and practical skills there. Over 800 university teachers, mainly full professors, doctors with a post-doctoral degree. The Faculty offers bachelor's degree/engineer studies (1st degree) and MSc studies (2nd degree) realized in the fields of management, management and enineering of production, logistics, computer science and econometrics and public health. The European Faculty of Engineering is a unit enabling education in English language within the fields of study conducted by individual Faculties of Czestochowa University of Technology. Postgraduate studies last 2 or 3 semesters. They are destined for higher education institutions graduates who wish to broaden and supplement their education, including the scope of the latest achievements of science and technology. Faculty of Economics and management has been established in 1959 at the Slovak Agricultural University in Nitra. Since then it has educated more 17 000 students including graduated students from PhD programs. Currently there are more than 2 700 students studying at bachelor, master and doctoral levels. In education FEM stresses both solid theoretical backgrounds based on the newest scientific theories and providing students with practical skills. The mission of the Faculty of Economics and Management is to provide students with high quality education in Economics, Business, Management, Marketing, Finance, Banking, International Trade, Policy Analysis, as well as in Law, Informatics and Quantitative Methods. The Faculty of Business and Economics of the Mendel University, founded in 1959, is the oldest in Moravia and is one of the basic pillars of our university systems in economics. It is accredited for all types of study programs: bachelor's, master's and doctoral. Based on its recent accreditation the faculty was assigned to group "A" of the best faculties from a total of 21 economics faculties operating in the Czech Republic. Traditionally, the faculty provides instruction in "Economics and Management" (EM), with four accredited programs: "Economics and Management", "Agriculture and Food Economy", "Social Economy", "Entrepreneurship in Tourism" and "Business Management". Another program with bachelor's, master's or doctoral accreditation, is the "Systems Engineering and Informatics" program with field of study "Economic Informatics" and the "Economic Policy and Administration" BA and MA programs, under which it is possible to study "Finance" and "Public Administration". The journal has been published since 2002 by the University of Miskolc, Faculty of Economics. The journal is published twice a year. All issues are available both in print and in online version. The journal adopted a double-blind peer review system ensuring that only the articles of the highest quality are published. TMP is indexed by RePEc, the Elektronische Zeitschriftenbibliothek EZB (Electronic Journals Library), EconBiz, Google Scholar and Proquest. The Journal of Economy & Society is a quarterly publication of the University of West Hungary. It is designed to provide information and fresh perspectives on issues of importance to professional economists and social scientists and to all readers interested in policies affecting economy and society. The journal has been publishes since the 1990s. In 2009 the journal was reborn, from this year it is published by the Faculty of Economics of the University of West Hungary. The main focus is given to the global and national questionof of economy and society. The journal is published twice a year. It has adopted a double-blind peer review system with an international team of reviewers. Former issues are available at MATARKA. Periodica Polytechnica Social and Management Sciences is a peer reviewed scientific journal published by the Faculty of Economic and Social Sciences of the Budapest University of Technology and Economics. It was founded in 1993. The Journal publishes both research and application oriented papers, in the area of management and social sciences. A special interest is given to papers addressing issues of the Central European region and of emerging markets. Each paper is evaluated in a double-blind review process (both peer reviewers and authors remain anonymous in the review process). Periodica Polytechnica Social and Management Sciences is indexed and abstracted in SCOPUS and Cabell's. The Hungarian Journal of Nutrition Marketing was established by the Institute of Marketing and Trade of the Faculty of Economics of the University of Debrecen, in September, 2014. The main goal of the new journal is to provide wider publicity and publication opportunities for researchers and professionals at different fields of food and nutrition marketing. The English summaries of the published papers and the English translation of figures and tables may help in the promotion of the new results at international level. The journal is peer reviewed and meets the scientific requirements of international scientific journals, its structure and editorial process are in compliance with the international standards. The journal is displayed at the website on nutrition marketing (http://taplalkozasmarketing.hu/) where the readers may find additional information about our work, results, partners and events. 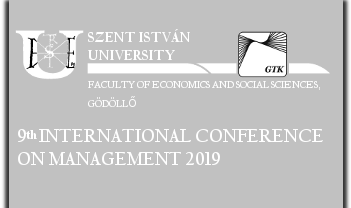 The Polish Journal of Management Studies (published by Faculty of management of Czestochowa University of Technology) is an initiative publishing theoretical studies and empirical articles from all management areas. Topics addressed in the journal are diversified and regard various management fields: accounting, theory and business management, marketing, financial management, economic analysis, statistics, informatics in management, logistics, innovations and human resource management. PJMS is indexed in SCOPUS, EBSCO, EconPapers, RePEc and Index Copernicus.